Deputies say 57-year-old Neenah man, Eric Richter, went missing after taking photos at a door county park. The search for him started Sunday night, but was hampered by the storm. Wednesday, the search continues with better weather conditions. DOOR COUNTY, Wis. — Deputies say 57-year-old Neenah man, Eric Richter, went missing after taking photos at a Door County park. The search for him started Sunday night, but was hampered by the storm. On Wednesday, the search continued with better weather conditions. At Cave Point Park, deputies deployed drones and underwater robots to try and locate Richter. The Sheriff's Office says Richter’s car was found at the park Sunday night. At that time, waves were over 5 feet and the shoreline was ice-covered and slippery. Deputies fear Richter was swept into Lake Michigan, as they recovered some of his belongings along the shore. For those reasons, deputies are warning people to stay away from the shoreline. "There are warning signs listed in the park,” said Chief Deputy Pat Mccarty with the Door County Sheriff's Office. “This is one of the most beautiful locations in door county, but dangerous conditions can exist with unsure footing and ice and snow." The Sheriff's Office. Says safety is a major concern as the shore remains icy. 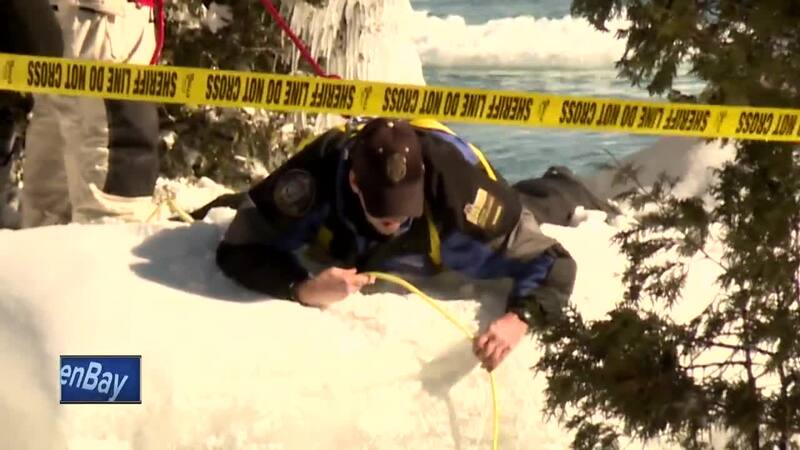 They even harnessed a DNR official to a tree and lowered him near the lake to set up the underwater robots so he wouldn't fall in himself. Deputies say they will not stop searching until they can bring closure to the family.